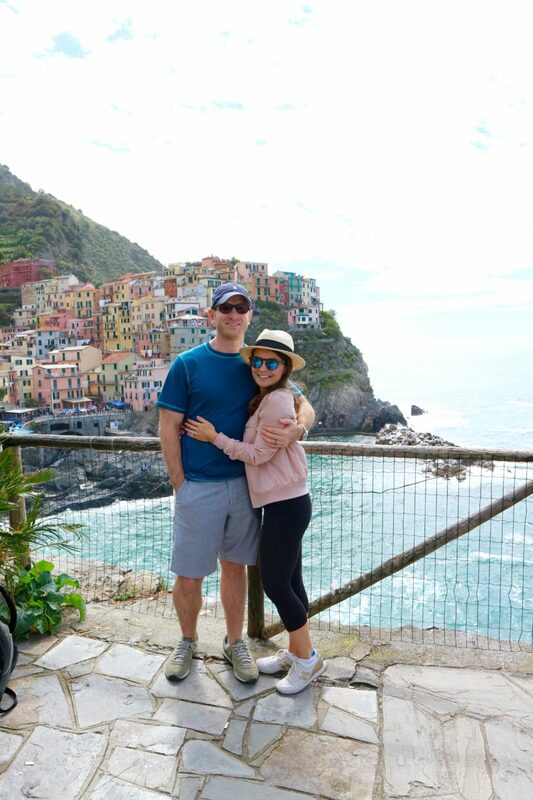 Cinque Terre was a highlight of our trip and where we spent our actual first anniversary! 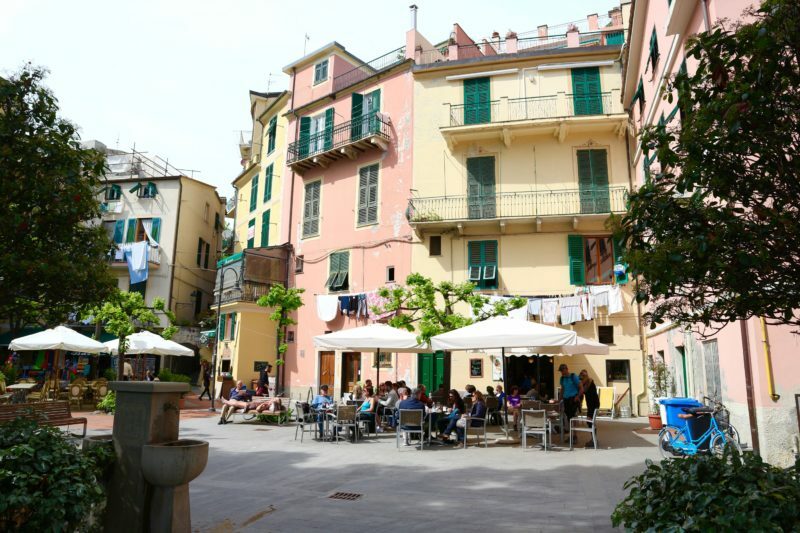 We stayed in Manarola (town 2) but also visited Vernazza and Monterosso (towns 4 & 5). 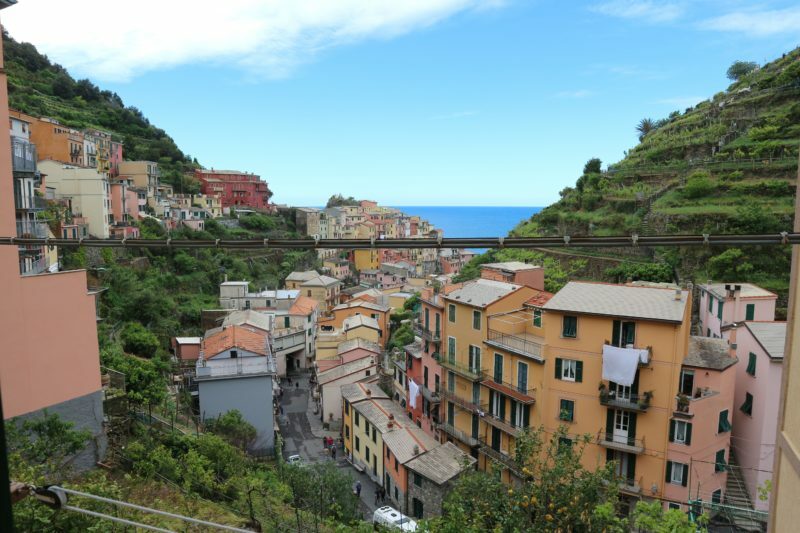 The other two are Riomaggiore (town 1) and Corniglia (town 3). We didn’t visit all five because we only had one day/night there but we easily could have because the trains to each town only take about 5 minutes each. There aren’t many actual hotels here, more like apartments or rooms that owners rent out. We stayed at Giovanni Rooms and I totally forgot to get a picture of the inside but you can see the room here. 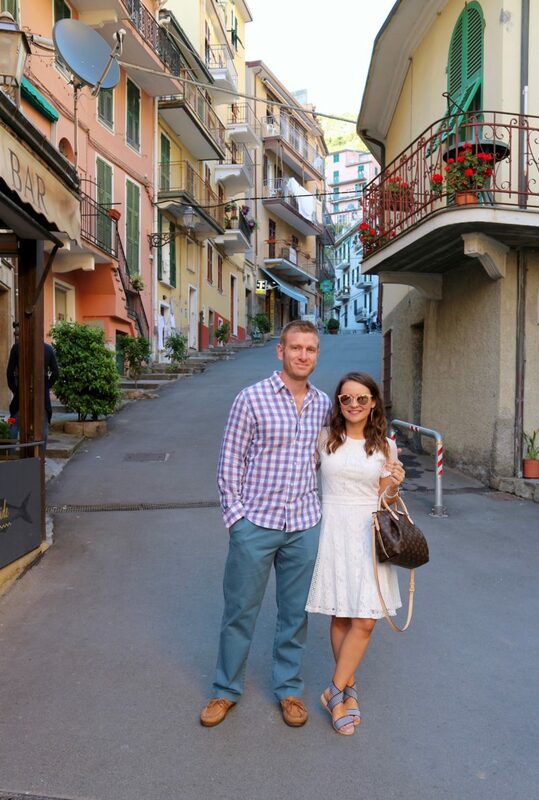 After rolling our luggage up the giant hill after getting off of the train, we then had to carry it up super steep stairs in the apartment, but that’s Italy! This view though? Simply amazing and totally worth it! After we dropped off our bags in our room, we needed some food ASAP! 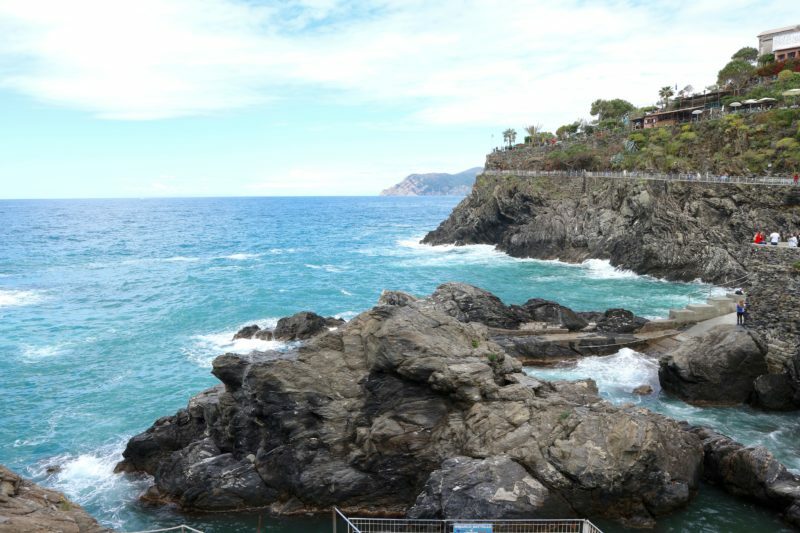 We walked through Manarola to check out some views of the Ligurian Sea and then grabbed lunch at Nessun Dorma. It’s an outdoor restaurant on the side of a cliff that overlooks the town of Manarola and gives you those postcard views (all while listening to Italian opera music). You can see the umbrellas of the restaurant in the picture below. We got a caprese salad and sandwiches before it was time to head on our hike. 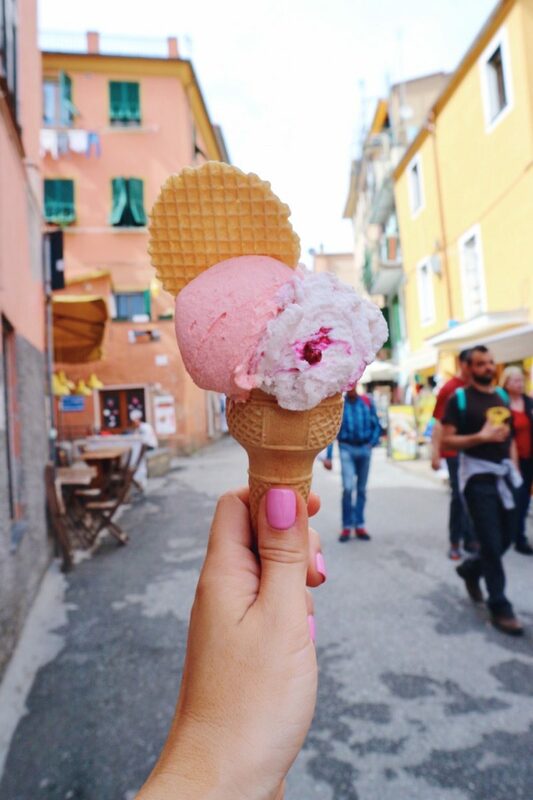 And we were in Italy after all so we can’t forget about the gelato! I think I got one in almost every city (along with cannolis and lots of tiramisu) but this one in Monterosso was pretty memorable. It was the reward after our long hike and was seriously delicious! Our favorite dinner of the entire Italy trip was actually in Manarola at a little restaurant called Aristide. We did a lot of on-the-fly dinners (we didn’t do too much planning) and Ryan just looked this one up on Yelp as we were getting ready and holy cow, was the food good!! 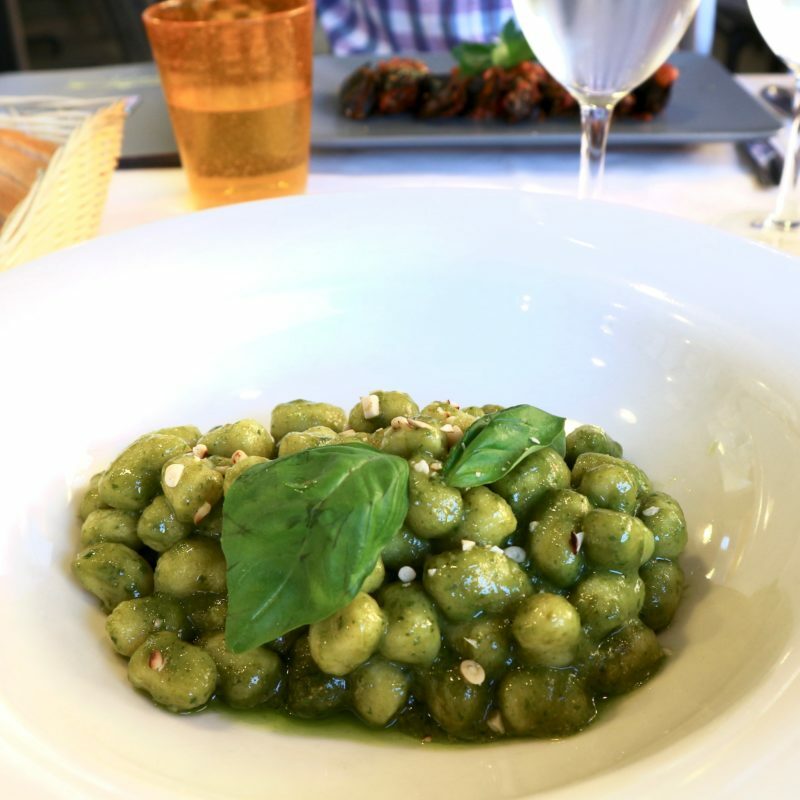 Cinque Terre is known for their pesto so I got the pesto gnocchi which was out of this world. We got a fried seafood dish complete with anchovies which I ate all of (am I weird for liking those?) 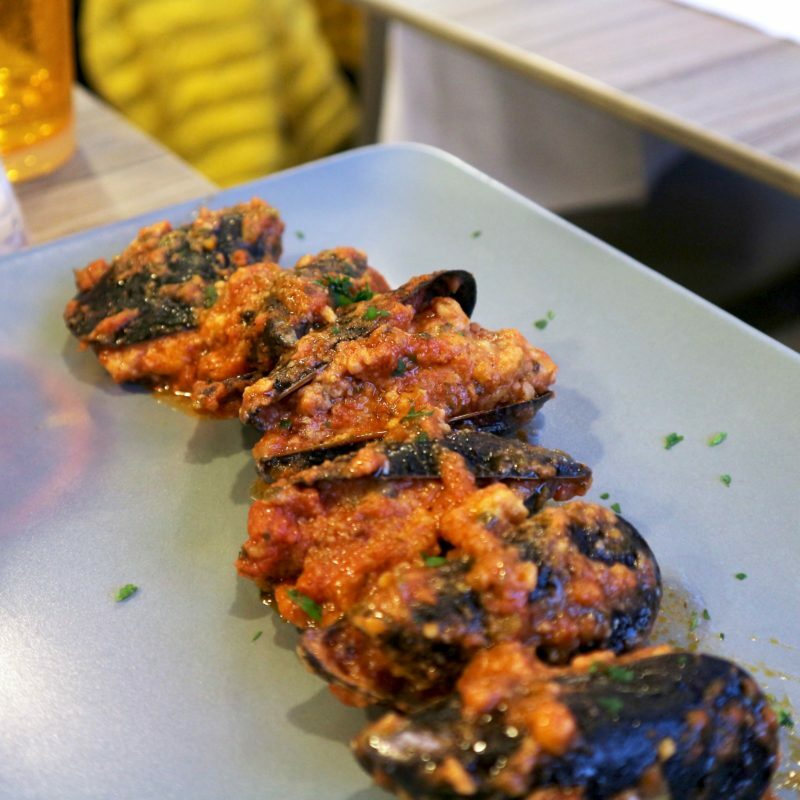 but what really stole the show was the stuffed mussels. They were one of the best things I’ve ever eaten- so good we had to order a second dish. All that food plus two bottles of wine… it was a great night! 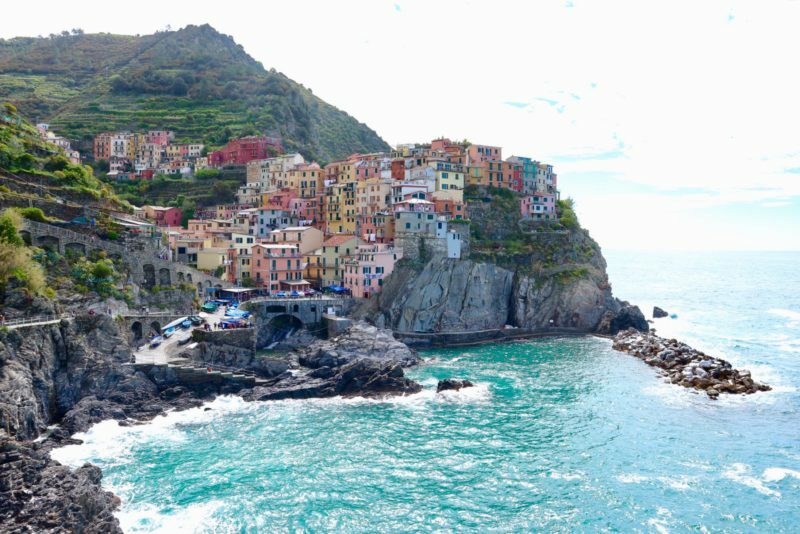 I highly recommend this place to anyone visiting Manarola. 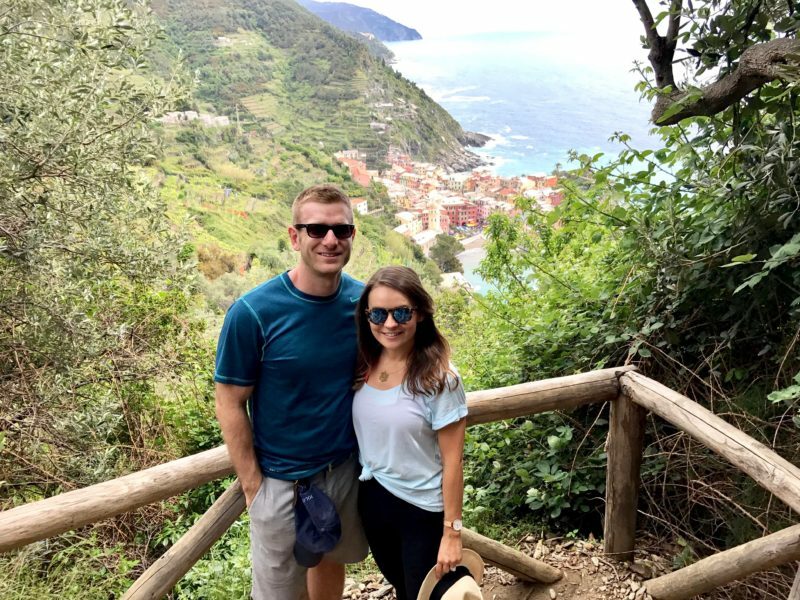 Since we didn’t have a ton of time here, we knew we wanted to do the one thing you should do when visiting Cinque Terre- hike. 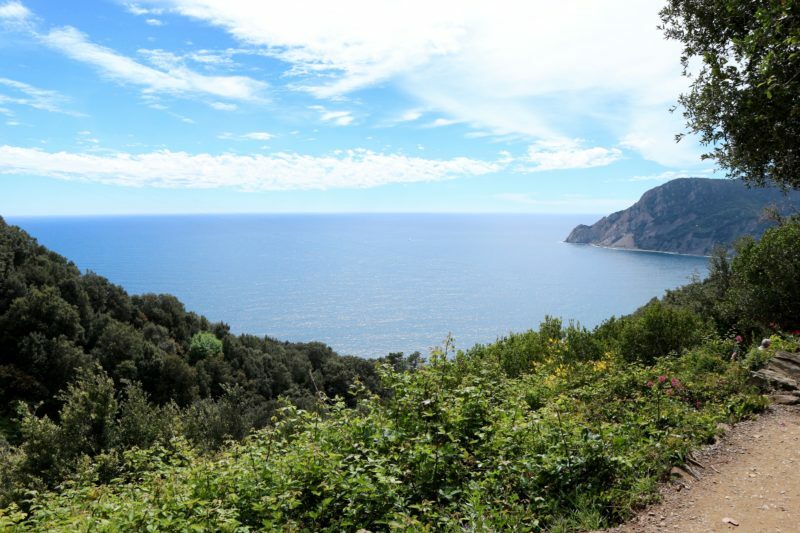 There are several trails but we knew we wanted to hike along the coast so we hiked trail #2 or the Sentiero Azzurro. 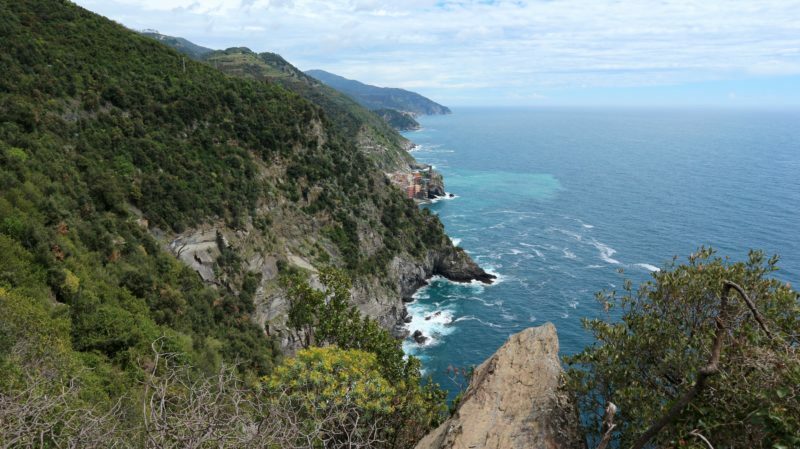 We took the train to Vernazza then hiked to Monterosso, which is the most challenging part of this trail. More stairs (yay!) and narrow pathways but y’all… the views are SO worth it. Seriously some of the most beautiful I’ve ever seen! 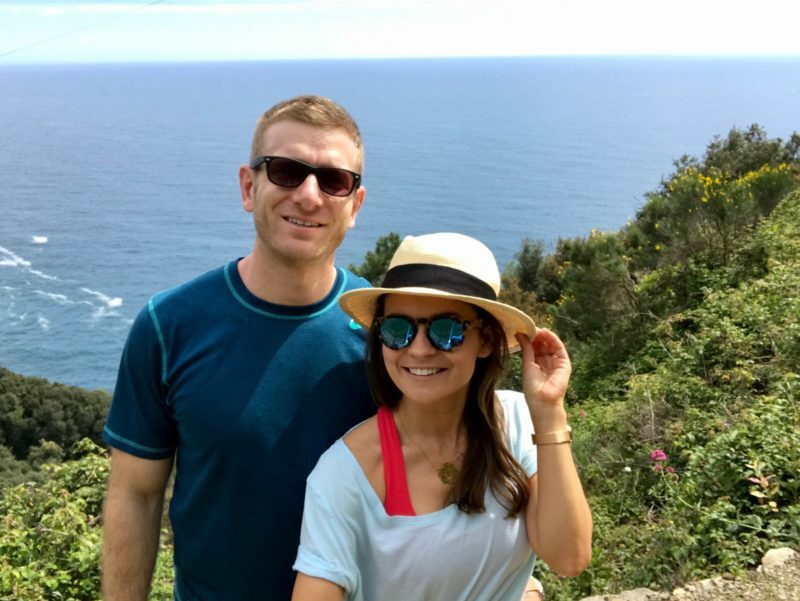 And the hike is legit- I think it took us about 2 hours when you factor in all the photo ops in between. Most of the trails are free but this one costs €5-7. You could definitely hike between all five towns if you’re an overachiever like that but it would take you all day. This is the view of Vernazza from the beginning of our hike. It was actually calling for rain which made me nervous for the hike, but luckily it warmed up and the clouds went away and we had a beautiful day of sunshine!! 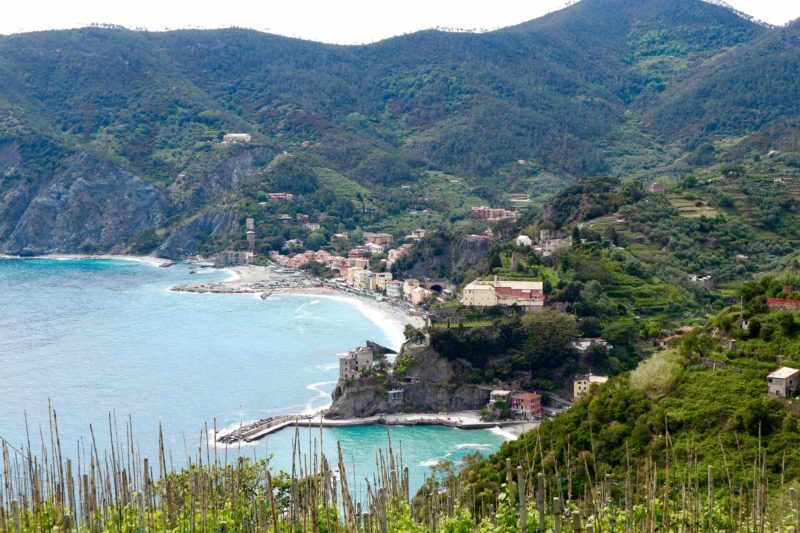 The view of Monterosso from the trail- this is the only town that has a beach and it was absolutely gorgeous. 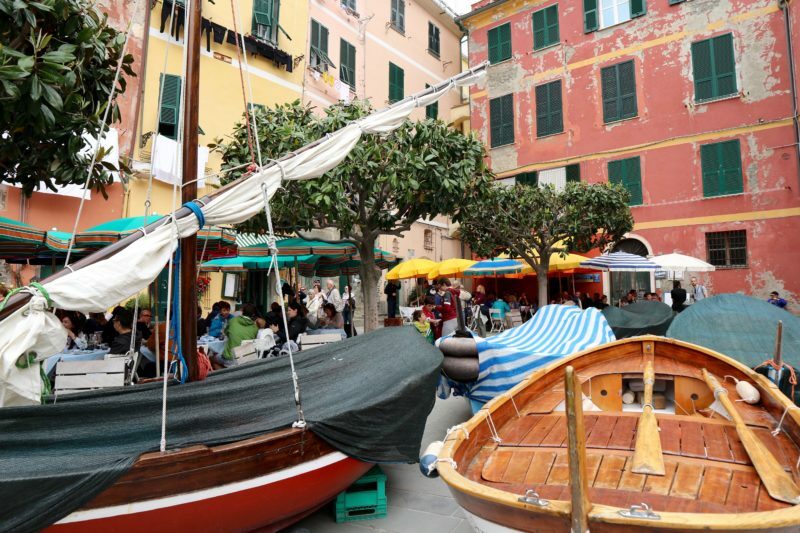 Wooden boats and palm trees everywhere! 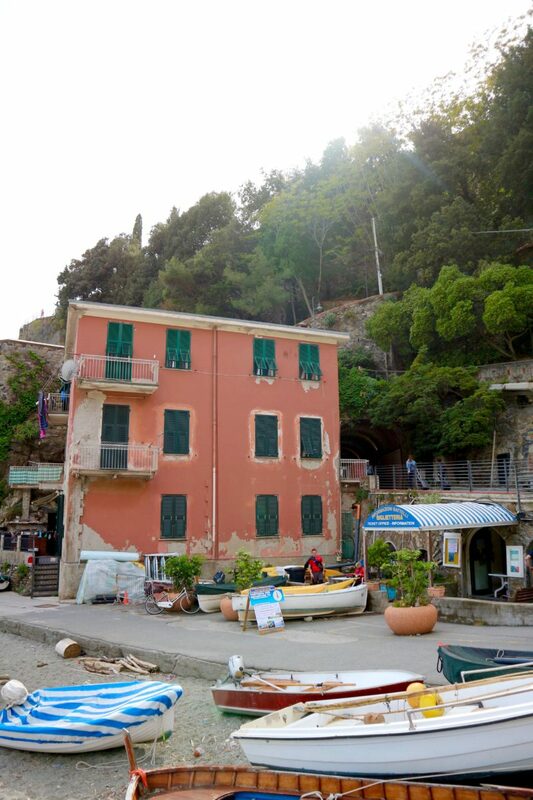 So there you have it, a short but very sweet trip to Cinque Terre was one of my favorites on our tour of Italy. The hike was such a great experience and we were so fortunate to have good weather. 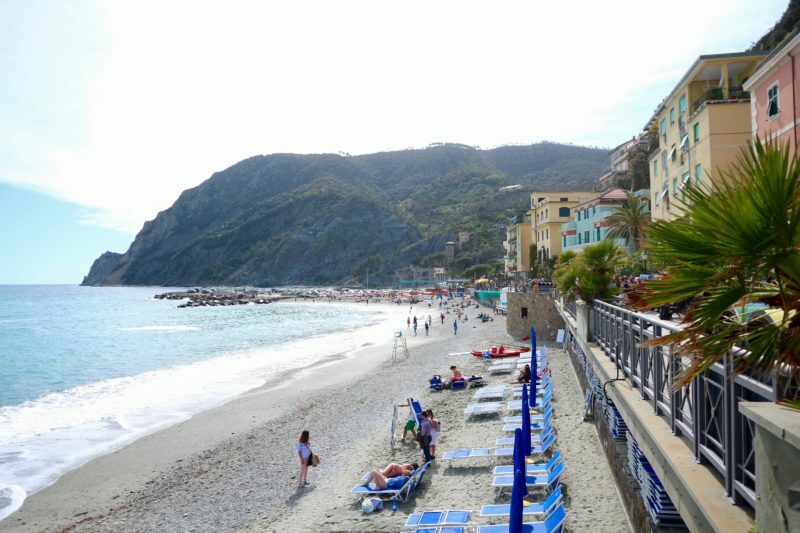 I would definitely say it’s a must-visit place in Italy because the five towns are just so unique and any town on the water is guaranteed to be gorgeous. Stay tuned next week for my next travel guide which will be all about Venice! The pesto is SO good!! We always stay in Manarola! Artside wasn’t open for the season when we were there, but it’s on my list for next time!! That hike is gorgeous! We made it the opposite direction late in the afternoon, and it was stunning… so many stairs though! 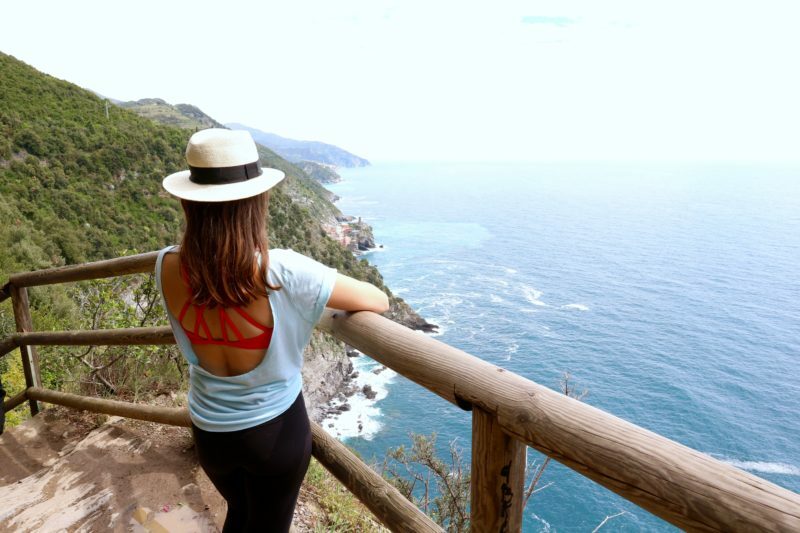 Cinque Terre was easily my favorite part of Italy and I was there exploring for 4 months!! 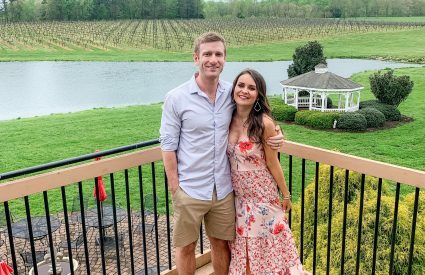 SO happy you guys got to go and so glad you enjoyed it – especially the food. Oh man, I still dream of the seafood. Happy Wednesday! we are going there this fall and i can’t wait! 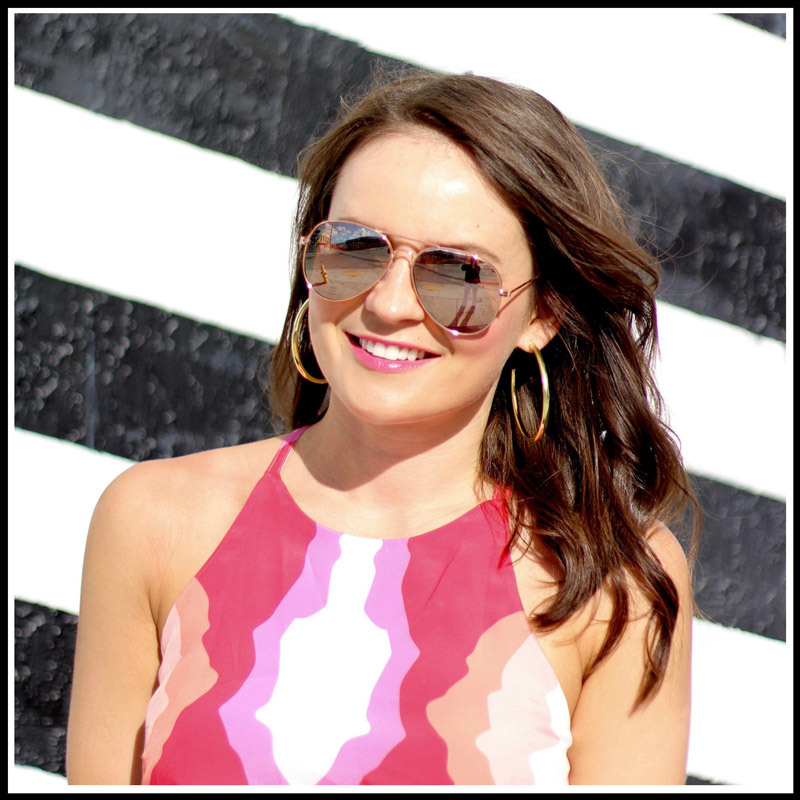 i am bookmarking your post! So neat!!! The views are just so picturesque, I can see why this was one of your favorite places! And I am loving that top/bra you wore for the hike. So fun! These photos are SO gorgeous and giving me serious wanderlust! I’ve been traveling a ton, but only in the states. Italy just jumped up my international bucket list! 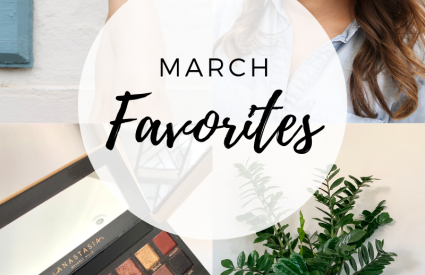 This is giving me major wanderlust! I’ve been to Italy twice and we haven’t made it to Cinque Terre so I’m pinning this for next time haha. I miss gelato breaks. 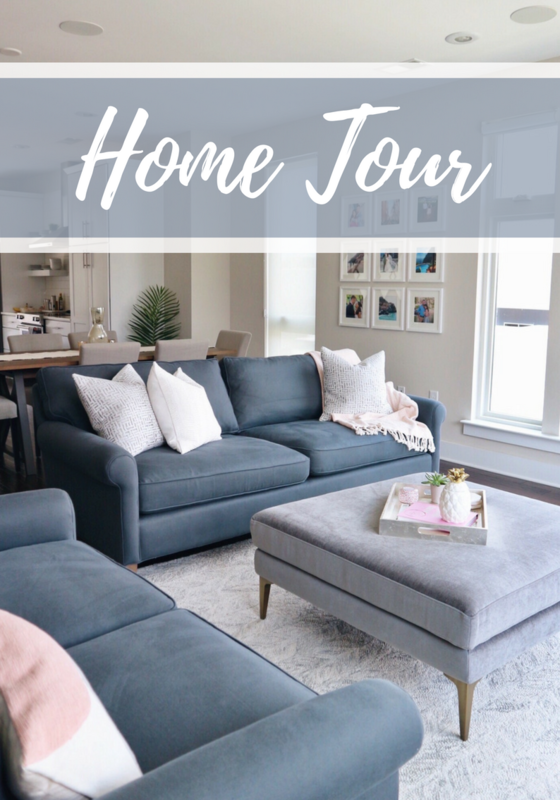 Such a great guide. Look like you had a ton of fun! 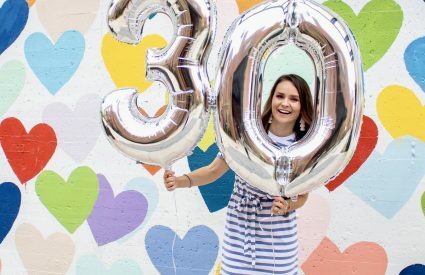 We’re thinking of going for our 1-year (or maybe 2-year) anniversary, so this is very helpful! I have always wanted to travel here! It looks beyond beautiful and amazing! Your photos are just gorgeous!!! Looks like the best time! 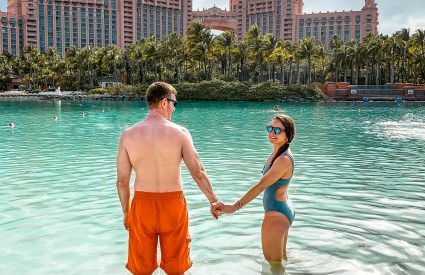 Such a perfect travel guide! I love it. OMG this looks amazing! It is my dream to go! Such gorgeous scenery! I have to go one day! I absolutely love your photos and knowing what y’all did. 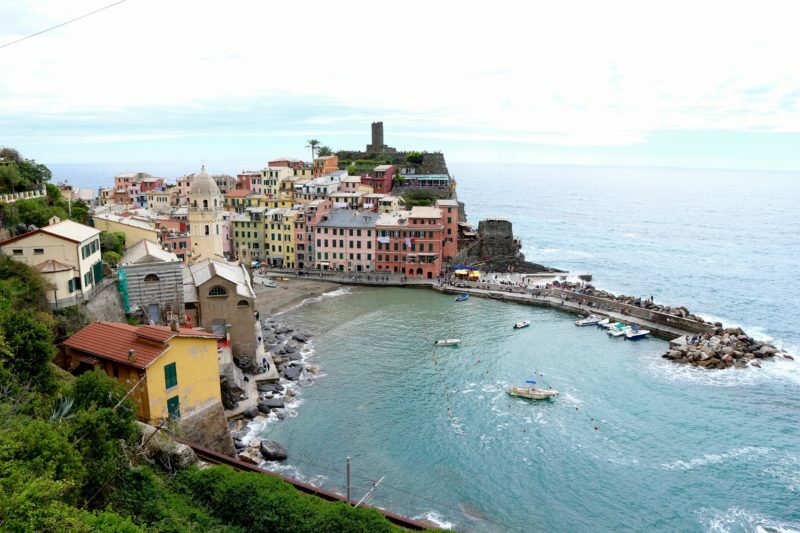 Italy is high on travel list and Cinque Terre is near the top of the list. 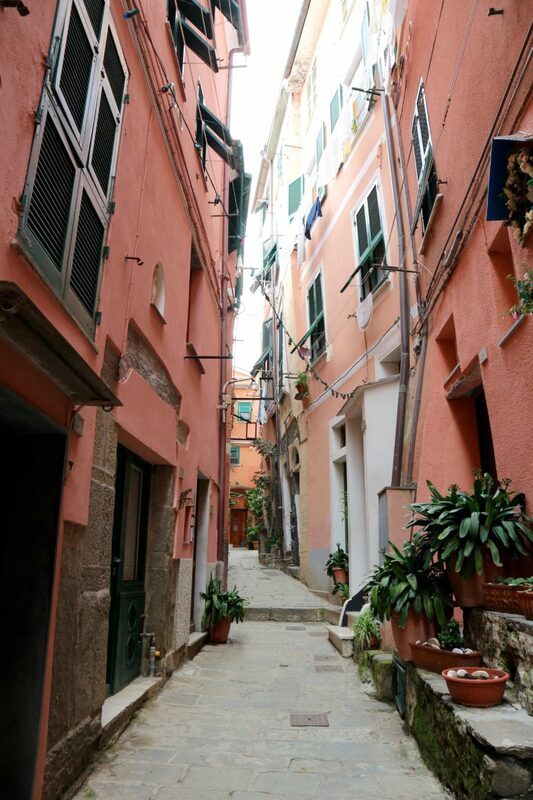 we are staying for 5 nights in vernazza ( i wanted a leisurely exploration here) and i will definitely be heading to that restaurant in manorola!